As we are now stepping into the spring season, our skin is supposed to feel happy. Truth is our skin also has different seasons just as a year has many different seasons. And in each season, it needs to be taken care of differently. Just because the driest and coldest time of the year is over doesn’t mean we can skip our good habits. In fact, now is the time to detox your skin and get back that lustrous glow you have been waiting for all along. Applying moisturizers is so much easier in dry seasons because we are aware that we need to put it on. However, we tend to be forgetful during other times of the year. If you are not pampering your skin now, there is a good chance that your skin will also be angry with you and not produce desired results. So it’s absolutely important that you keep up your moisturizing practice. As it is less dry, you can be less frequent. However, get it done after washing your face, taking a shower and before going to bed. Avoiding the sun completely is just not possible, so the best solution is to wear sunscreen - even on cloudy days. Look for the words “broad-spectrum” on the bottle. This indicates that it protects against both UVA and UVB rays. Also make sure that the sunscreen you choose contains an SPF of 30 or higher. Detoxing isn’t just for your body; it’s for your skin too. For clear, radiant skin go on a ‘skin detox’. It’s never too late to start. From eating healthy to maintaining a religious skincare routine, there’s nothing better to get your skin in tip-top shape. Drink two cups of warm water with lemon each day to flush your system. Eliminate salty snacks to prevent swelling and water retention. Get the right nutrients every day by eating plenty of fresh vegetables and fruits. Minimize intake of processed sugars. A few minutes after cleansing, tone your face with a toner and a cotton pad. Toner is used to restore your skin’s natural pH levels, which were probably altered during cleansing. By restoring your skin to its natural pH, you also make it more resistant against bacteria and microorganisms. Use the toner that suits your skin type. This is essential with people who have an oily skin type. Besides these, make sure you clean your face regularly with a good facewash or a gentle soap. 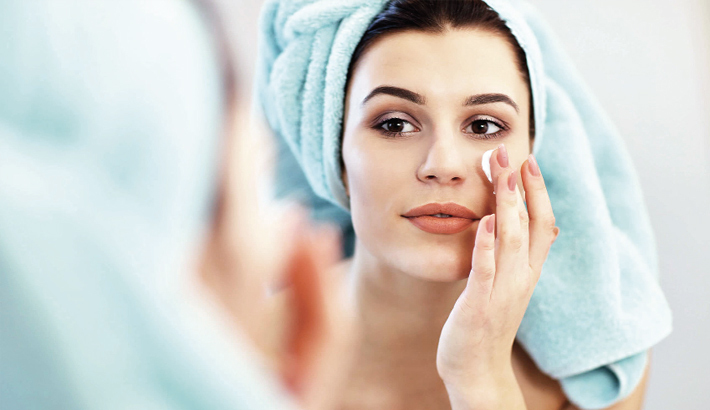 These habits will surely get your skin glowing in no time.